If you are one of those people who plan their vacations around food, I would bookmark my most recent giveaway post. People! You live in places with incredible bounty and I look forward to each and every one of your packages. Just kidding. I really did love reading where you are from and what is delicious from your part of the world. I think we are lucky here with the amazing produce and access to great wine, not to mention many different world markets. But clearly, I need to get out more. Our lovely winner, picked by a random generator is comment #81. Melissa, in your own words, where do you live and what would you include? Melissa, send me an email and I will send you the goods! Onward. Salad. A couple of weeks ago, I took a class from a local celebrity – Ethan Stowell. Mr. Stowell has four well-regarded restaurants in our fair city – three of which I have had the pleasure of dining. He also has a new cookbook and has just started selling his pasta in gourmet markets around town. The class I took was all about gnocchi, something I have made before without great success. Seeing as it is one of Randy’s all-time favorite things to eat, I thought learning from a master would be great. I can tell you, it is wonderful to take a cooking class now and then, especially if you are a teacher. Sometimes it is nice to just sit back and be a student. I enjoy watching someone else’s style and there always seem to be terrific tidbits that I take home. 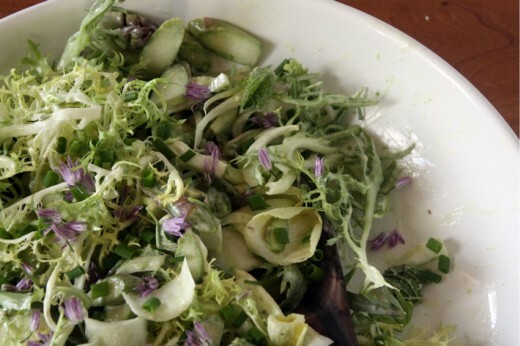 Like watching Ethan prepare this salad and noticing that he peeled a fennel bulb. You know, you get a fennel bulb and the outside is all bruised and, if you are me, you take off off that outer layer, but then you are left with a much diminished bulb. I learned, just from watching – nothing that he said – that you just take a vegetable peeler to that bruised outer layer and just make it right. That right there was worth the price of admission. Inexplicably I was out of canola oil so I substituted with some bright green grapeseed oil. I’ve made salad dressing with grapeseed oil, Suzanne Goin’s amazing Green Goddess Dressing to be exact, and have been pleased. I’m not so sure I loved it here. We are very much a vinaigrette family and I make my dressing with a lot of bite. Maybe the creaminess was just too much for us here – although there is no cream. But we both loved the vegetables, such a nice departure from my old standby salad. Put the egg yolk, water, mustard, salt, and vinegar in the bowl of a food processor fitted with the metal blade. Turn on to blend, then pour the oil in through the feed tube. 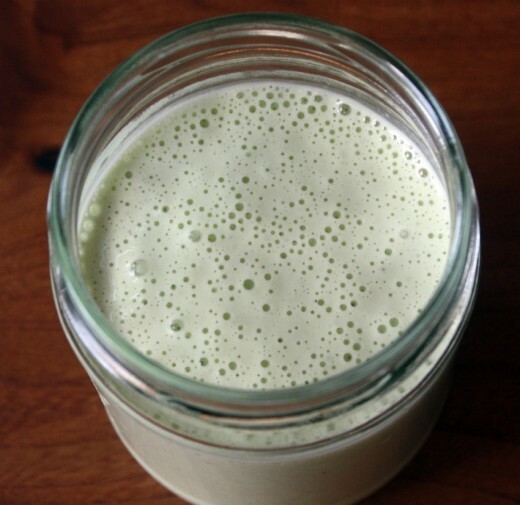 Process until the dressing is emulsified. Taste and add more salt if necessary. Put all the vegetables in a large bowl. Toss with just a bit of dressing, adding more as necessary. 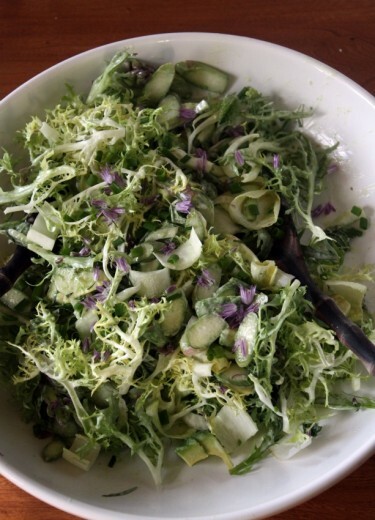 Now THIS is a green goddess salad (minus the dressing)…all of these beautiful green veggies shaved and fresh! 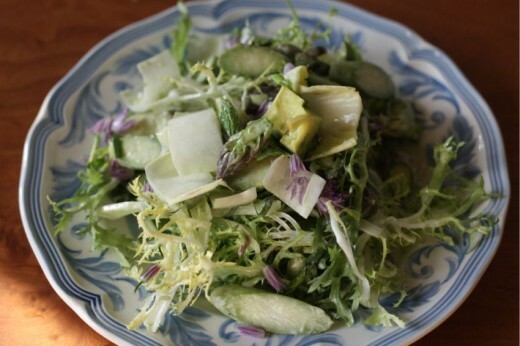 Loved shaving asparagus raw this spring season, it was so different from cooking the vegetable. I’ve never had green goddess dressing but this sounds amazing. And I just love the look of that salad which reminds me that I’m in serious need of visiting the local farmers market. Beautiful as always, Dana! I’m taking Ethan’s gnocchi class this Sunday – thanks for the preview! That salad is beautiful! I love that you get a little of each veggie in every bite. Lovely salad! I loved this. I just made ricotta gnocchi last night (and they worked better than ever before – yay!) Also I had the same epiphany about shaving a vegetable to preserve more of the vegetable last week when doing bok choy – I did it so we would have some vegetable left to eat at the end of things. Funny to see the same suggestion here. I love the idea of peeling fennel bulb! Every time I remove the outer layer, what remains seems tiny. And, I love learning things like that.